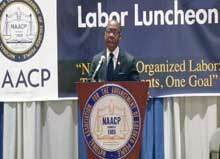 New NAACP President Cornell William Brooks hosted a labor luncheon at the civil rights organization’s 105th annual Convention in Las Vegas. The IAM joined thousands of civil rights, labor and community activists at the 105th NAACP Convention in Las Vegas recently to reaffirm their commitment to justice and equality. The new president of the NAACP, Cornell William Brooks, called for a renewed push for organizing workers in America. The average full-time black worker still earns nearly 20 percent less than the average full-time white worker, according to the latest data from the Bureau of Labor Statistics. Senate Majority Leader Harry Reid (D-NV), Reps. Marcia Fudge (D-OH) and Debbie Wasserman Shultz (D-FL), Sacramento Mayor Kevin Johnson and Vice President Joe Biden also spoke at the five-day convention. “You know, I know, that when justice rings out for one group, it rings out for all groups in America,” said Biden.